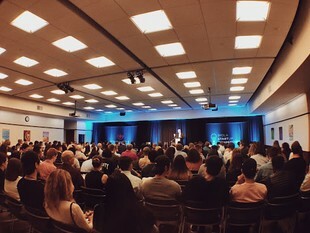 Biola University’s Crowell School of Business kicked off the 3rd Annual Biola Startup Competition on Monday, Sept. 25 featuring Lynsi Snyder, CEO for In-N-Out Burger. The startup competition offers Biola students and alumni the opportunity to transform an idea into a successful company. Participating teams can win up to $15,000 in awards to launch their business in addition to other awards and are aided by experienced business leaders throughout the competition. In a discussion moderated by Gary Lindblad, dean of Biola’s Crowell School of Business, Snyder-Ellingson shared wisdom she has learned throughout her career, professionally and personally at the kickoff. Students and faculty were able to learn about her story and leadership style. Snyder-Ellingson is closely involved in every aspect of business operations and company culture at In-N-Out Burger. She directs all of In-N-Out’s philanthropic efforts through the In-N-Out Burger Foundation and she strives to maintain and enhance the wellbeing of the entire In-N-Out family which number more than 24,000. “I know that the biggest message for what I’m doing on a daily basis is taking care of people,” said Snyder-Ellingson. Last year, the winning team’s startup was Illuminate International, a social enterprise publishing children’s books by global storytellers to fund their education empowerment model in under-resourced schools around the world. Team members received a $15,000 cash award along with a $10,000 legal services startup package from Brown & Streza, LLP and an accounting services startup package from Nienow & Company, LLP to get their idea up and running. Details including how to participate in this year’s competition were shared at the kickoff event which was held at Biola’s Andrews Banquet Room at 7:30 p.m. There are three rounds to the competition with the final round concluding in a 15-page business plan developed by finalist teams who will be matched with a personal coach to assist in their plan. Finalists will pitch and present their business plan to a panel of judges in March 2018, who will select the winners of the competition on the same day. View the event schedule and find out how to join the competition online. Written by Alisa Ohara, media relations intern. For more information, contact Jenna Loumagne at (562) 777-4061 or jenna.loumagne@biola.edu.